One of our newest entries into the camera trailer market is the MSU Standard. 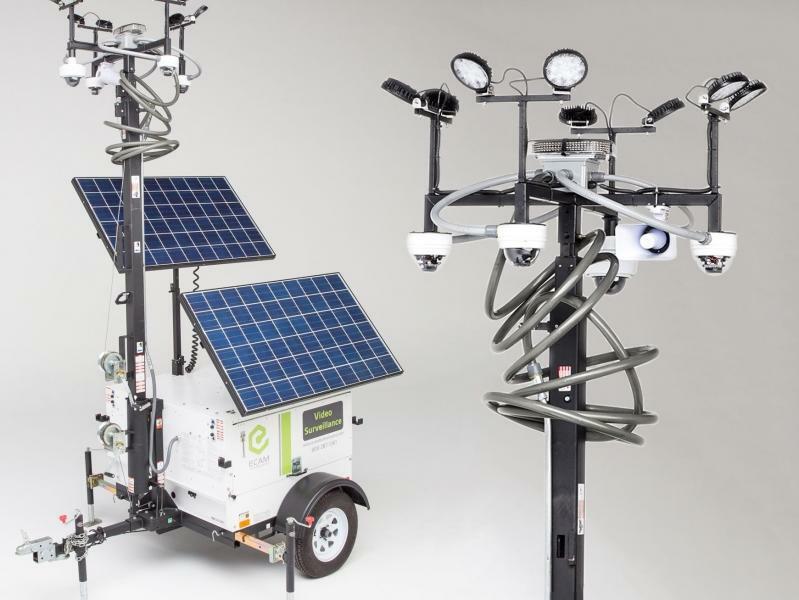 Boasting the same features as our top-of-the-line MSU Pro in a smaller configuration, the MSU Standard begins with two high-quality online accessible construction cameras mounted to a sturdy mobile cart. At larger job-sites, the MSU Standard can be wirelessly networked to multiple wireless surveillance units for centralized recording and review. The MSU Standard is perfect for smaller sites that do not require as many cameras as the MSU Pro. 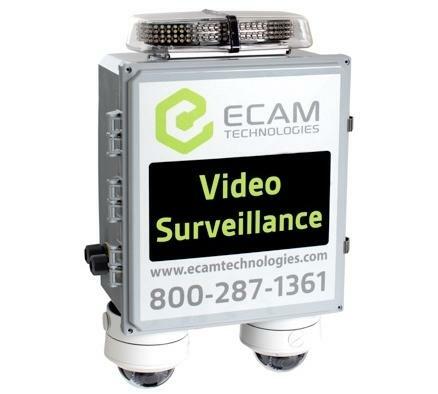 This unit provides the same customizable webcam options as our other products, including license plate capture, motion detection, and night vision thermal cameras. For even greater cost savings and more flexible installation, the MSU Standard features a built-in solar array. This means the cost of operation of the MSU Standard is practically zero, and it does not require an on-site power source to function. One of the most effective ways to keep materials thieves away from a jobsite is through the use of visibly apparent security measures. The best kind of security is the kind that prevents crime from happening at all, not just offers a record of it after the fact. The construction industry is still plagued by materials theft, despite the upturn in the economy. Materials and equipment ranging from pipes and lumber to power tools and even hardware are valuable to the right buyers. Jobsites are typically seen an opportunity for an easy quick buck, and so criminals often target them. To the wrong sorts of people, the idea of rolling onto a jobsite with a pickup truck and driving off loaded up with material is all too appealing. Fortunately, these people are typically not too smart and not too brave. Place a few construction cameras or a camera trailer on site, and the majority of would-be criminals will head off for greener pastures. Add a few signs pointing out that visitors are under surveillance, and perhaps a motion-activated light, and the likelihood of theft drastically decreases. Use visual theft deterrents like signs and camera trailers, and most thieves will be scared off. The MSU Standard with its looming camera tower is effective both as a surveillance tool and as a deterrent. Supplement cameras with signs, lights, and two-way audio to keep criminals away. When a break-in does occur, the MSU Standard’s webcam technology means dispatchers, security personnel, and police can have instant access to see the intruders. Hybrid power using solar panels and on-site power. Functions whether or not a local power source is available. Camera trailer is fully mobile and can be moved around the jobsite as needed. Flexible enough to secure a small site with one MSU Standard, or a larger site by wirelessly networking several units. Solar panels and deep cycle batteries are a green way to secure the jobsite, enjoying a cost savings on operation while protecting the environment. For those more determined or less observant thieves who proceed despite the risks, the MSU Standard can deliver on its promises. Powerful remote management capabilities mean the webcams are fully online accessible. Live and recorded footage can be viewed at anytime from anywhere with an Internet connection. When you pair a camera trailer with a UL-Listed Central Monitoring Service, professional operators will instantly tune in when a camera picks up motion. From there, property managers, security guards, or even the police can be quickly dispatched. In the construction space, solar camera options such as the MSU Standard offer unique advantages. Traditional webcam solutions require on-site power, and often also need a wired connection to a central recording device. Even if on-site power is available, wires strewn across a jobsite are cumbersome and present a security risk as they can be easily cut. The MSU Standard is available in a plug-in version or solar powered for jobsites with limited or no power. The MSU Standard is self-powered using crystalline PV array solar modules and deep cycle batteries. This carries a number of advantages that translate directly to the bottom line. 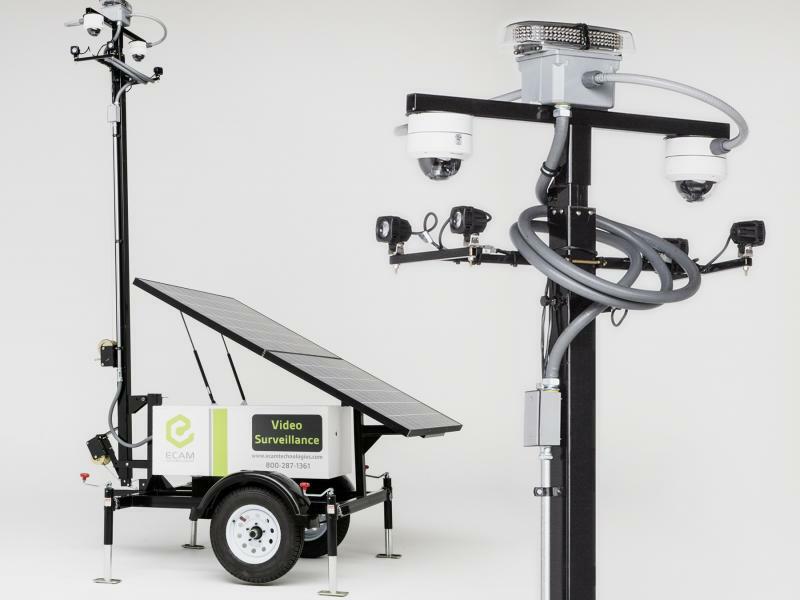 Installation of the self-powered camera trailer is fast and easy, with minimal labor cost. Without wires to run or cameras to mount, the MSU Standard is essentially a “set-and-forget” security solution. There are no power cables to connect, coaxial cables between the cameras, or network cables between the unit and an Internet gateway. Because it relies primarily on solar power, the MSU Standard is highly economical to operate. The cost savings realized by taking security off the grid means the MSU Standard can pay for itself over time, especially given that it is completely mobile and can be taken with from job to job. Highly scalable. One unit protects a small area, and wirelessly networks to more cameras for additional coverage. Installation is fast, easy, and inexpensive. No wires or cables required. Reusable after the job is done. The entire MSU Standard can be rolled off site after the job is complete with no need to replace parts. Solar panels mean a lower electricity bill. For even greater savings, tools and other equipment can plug into the MSU Standard and use its solar array. Customizable camera options mean no wasted resources on unused features. Choose standard cameras, night vision, license plate capture, and more. Hybrid power solution uses on-site power only if available and required. The solar array built into the MSU Standard offers benefits beyond security. By plugging power tools, work lights, and other equipment into the MSU, an entire work crew can go green. The solar panels are highly efficient and can easily power construction equipment during the day. The easy availability of solar power on a jobsite will help realize cost savings over time. Power costs add up, after all, and letting them come in under budget will help the entire project. By leveraging a renewable resource, any construction firm can protect both the environment and the bottom line. These cost saving features do not come at the expense of surveillance effectiveness. The MSU Standard is flexible and customizable, with full support for cameras that incorporate features like license plate capture, pan / tilt / zoom, and night vision. The MSU Standard is the perfect balance between powerful features and cost savings. Its flexible build options and ability to network to other camera stations mean it makes economic sense to use at any size job. Best of all, the cost savings don’t mean sacrificing security. Top-of-the-line webcam features mean your investment in materials and equipment is protected, 24 hours a day. As a sole security solution or as a piece of a larger security network, the MSU Standard is the perfect choice for any construction firm. With its wireless networking capabilities, the MSU Standard is fully scalable to work on any size job. For smaller applications like a single entryway, a single MSU Standard with its two construction cameras is typically more than sufficient. On larger sites or more open sites where multiple camera stations may be required for complete coverage, additional wireless surveillance units can be added.